Well, this article is not about Blender 3D like the other ones, but I do believe that the resource that I`m going to talk about is very valuable for anyone interested on developing even more, in architectural modeling. Last week I was browsing a few sites when I found a notice, about a set of tutorials produced by an artist called Wolfgang Rode, which is a Cinema 4D user. 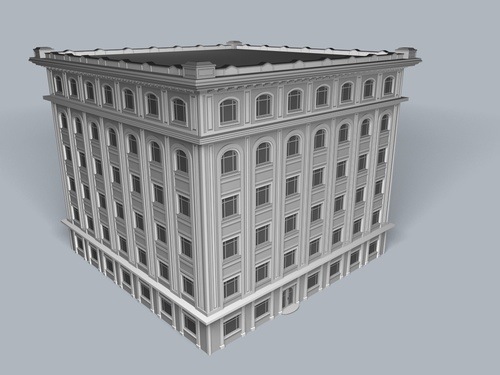 The tutorial is a set of about 40 short videos (about 6.5 hours of total runtime) that shows the process of modeling for the building that illustrated this article. All the process is illustrated and narrated by the artist from scratch, using Cinema 4D. Since the tutorials use common tools available in most 3d softwares, including Blender 3D, the tutorials and technique can be adapted easily to Blender! The tutorials are a mix of Poly modeling and path modeling, using the tools of Cinema 4D. This is something I always say to my students, even if you only use one tool to work, it doesn`t mean that you only have to watch educational material related to that specific software. Especially if this material is free and so detailed like this one. For instance, if the artist uses extrude to create a 3d shape we can easily reproduce the 3d object. All we have to do is find out how to create the same shape in Blender, even if we use a different tools or technique from the original tutorial. Ok, how to get the files of the tutorial? They can be downloaded at c4dexchange, which is a web site that Cinema 4D artists use to share resources. The files are hosted there, in the tutorials section. To get access you must register, and the registration has no cost. To watch the files, you will need the TSCC codec from techsmith (windows only). I just tried to watch it with VLC and the video doesn`t look good, with a lot of flickering and blocked images. So, I moved from OS X to a windows box and used the Camtasia Player, available in the techsmith web site (windows only). With the camtasia player I didn`t find any troubles watching the videos.